Johann Wilhelm Abel was my great grandfather. In the early 1860s, he began preparations to leave his home in western Germany for a new life in the United States. He may have read about the area from other Germans who had already made the trip and had written back to their family and friends with stories of their new homes. He may have read articles or advertisements printed in the German newspapers which encouraged settlers to venture into the Midwest by German and American promoters. [i] It is doubtful that I will ever learn the true reason for his emigration. I have spoken with family members still living in Germany and they believed that he must had heard about it from other locals who had gone before him. 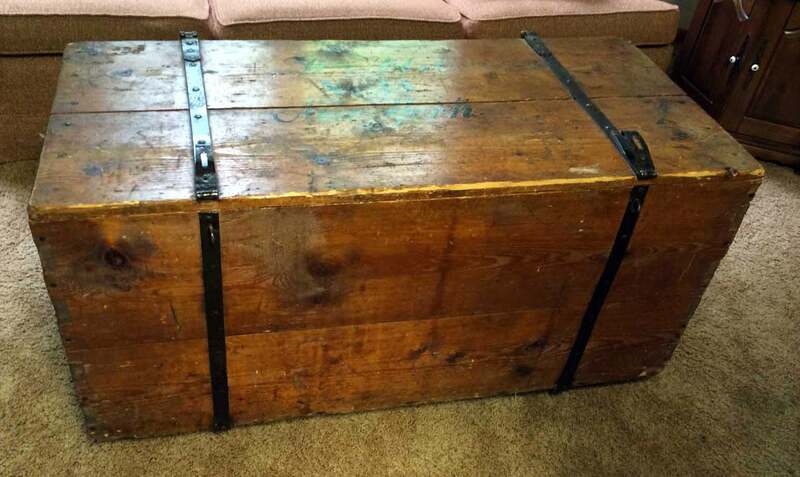 Last summer, I was thrilled to be able to touch a piece of my ancestry…the trunk that my great grandfather used to transport his belongings from the old country to the new. I admired the simple construction. 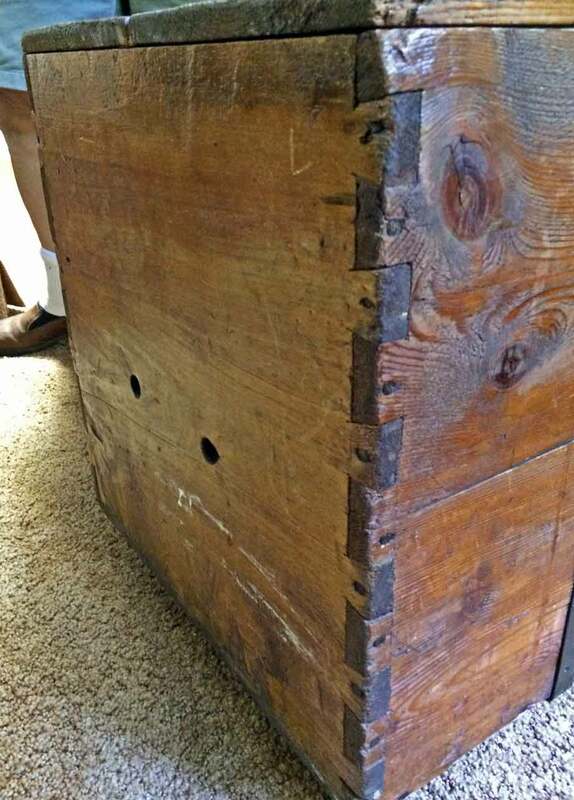 A mix of nails affixed the boards together and dove-tail joints were used on all corners. Johann Wilhelm Abel must have agonized over what to take with him and what to leave behind; the idea of sailing back for some forgotten items must have been out of the question. Did he need to include the items that his wife and babies would need? They may have had a second trunk for themselves. He must have needed a few clothes, a few essential tools, perhaps some items to remind him of home, perhaps some books written in German. In addition, some basic foods and cooking equipment would be needed by the family who traveled between decks, in the steerage class. The next big question for me was…what would I have put in such a trunk? How does one whittle away their possessions until it all will fit into a truck that is perhaps 48 inches long, 24 inches deep and 30 inches wide? I have been privileged to have made a similar trip but in reverse…I moved from Michigan to Europe for several years. I assure you that I was not able to pack all of my belongings into a trunk of similar size! 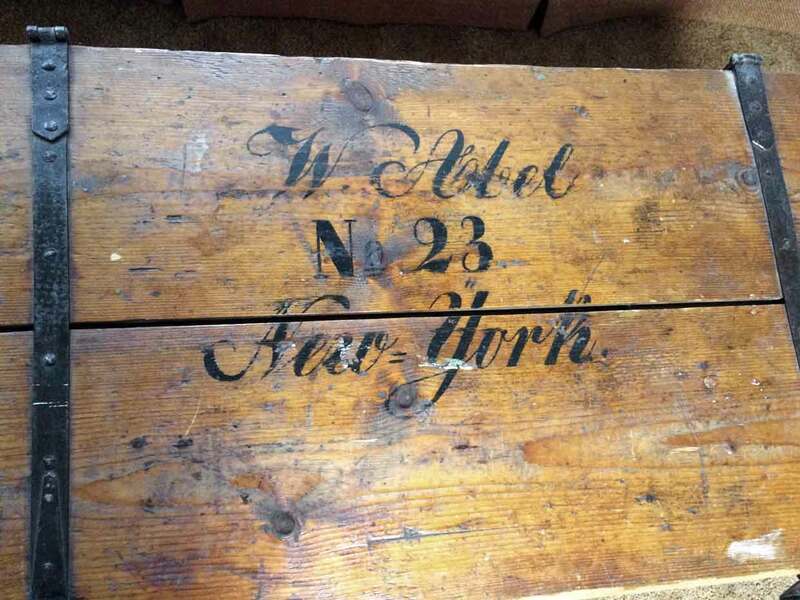 I first learned about the gut-wrenching experience of packing a trunk for a lifetime when I visited the Ellis Island National Museum of Immigration in New York. I encourage you to visit Ellis Island if you ever get the chance. [i] Sisson, Richard, Christian Zacher and Andrew Cayton, ed., The American Midwest: An Interpretive Encyclopedia (Indiana University Press, Bloomington, IN, 2007), 207-208; digital images, Google Books (http://books.Google.com : accessed 16 January 2017). [ii] More than one source shows that he initially used the name “Wilhelm” when in the United States; if interested, contact me for reference details.